Sciency Thoughts: Eruption on Rincón de la Vieja, Costa Rica. Eruption on Rincón de la Vieja, Costa Rica. The Observatorio Vulcanológico y Sismológico de Costa Rica-Universidad Nacional reported a small eruption on Rincón de la Vieja, an active volcano in the northwest of the country, at about 4.20 pm local time on Tuesday 15 March 2015. 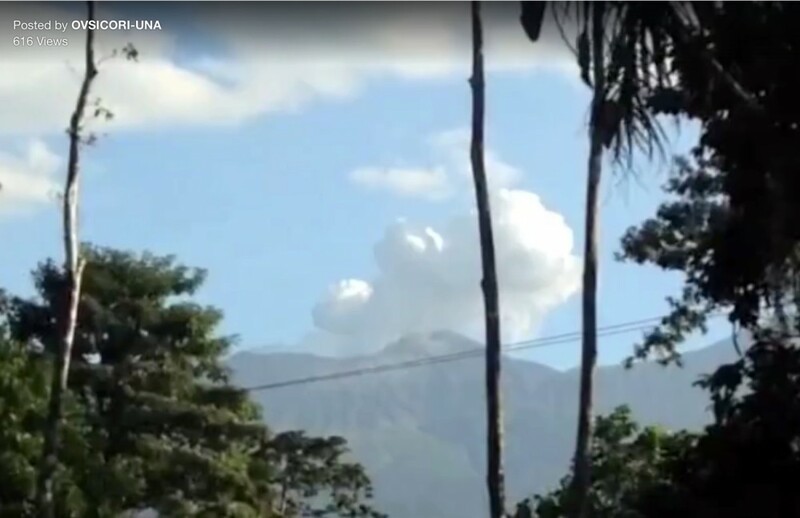 This is the latest in a sereis of small eruptions on the volcano that started in September 2014, and produced a column of gas and ash which rose about 700 m above the top of the mountain. An earlier eruption on 9 March this year led to small ash-falls in some local villages. Such small eruptions are not in themselves dangerous, but can be indicative of rising activity on a volcano capable of much larger eruptions. Ash column over Rincón de la Vieja on 15 March 2016. Observatorio Vulcanológico y Sismológico de Costa Rica-Universidad Nacional. Rincón de la Vieja is a complex volcano (volcano with multiple eruptive vents rather than a single crater at the top of a cone-shaped mountain) rising to 1916 m above sea-level in Guanacaste Province in the northwest of Costa Rica. It is located within the Rincón de la Vieja National Park, where along with an associated hot spring system it forms an important part of the local economy. Prior to the onset of activity in September 2014 the volcano had been inactive since September 2011, and the last major eruption occurred in 1966. A small geothermal energy project, the Las Pailas Geothermal Power Plant, runs on heat from underground rocks associated with the volcanic complex. Rincón de la Vieja forms part of the Cordillera de Guanacaste, a range of volcanic mountains running through northern Costa Rica close to the border with Nicaragua and forming part of the Central American Arc. These volcanoes are fuelled by the subduction of the Cocos Plate, which underlies part of the east Pacific Ocean, beneath the Caribbean Plate, on which Central America lies, along the Middle American Trench, which lies off the south coast of the country. As the Cocos Plate is subducted it is gradually melted by the heat and pressure of the Earth's interior, with some more volatile minerals rising through the overlying Caribbean Plate as volcanic magma. 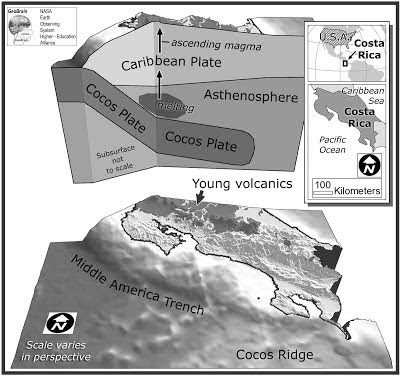 Diagram showing the passage of the Cocos Plate beneath Costa Rica (not to scale). Carleton College. Magnitude 4.6 Earthquake off the coast of Limón Province, Costa Rica. Asteroid 2016 FU6 passes the Earth. Asteroid (455148) 1994 UG passes the Earth. Asteroid 2016 EN156 passes the Earth. Seasonal exospheres detected on Dione and Rhea. Asteroid 2016 EM156 passes the Earth. Asteroid 2016 FC1 passes the Earth. Dating a Pleistocene Stegodon from West Timor. Asteroid 2007 DM41 passes the Earth.